@walfridolopez' blog: Why even Google can't connect Cuba? 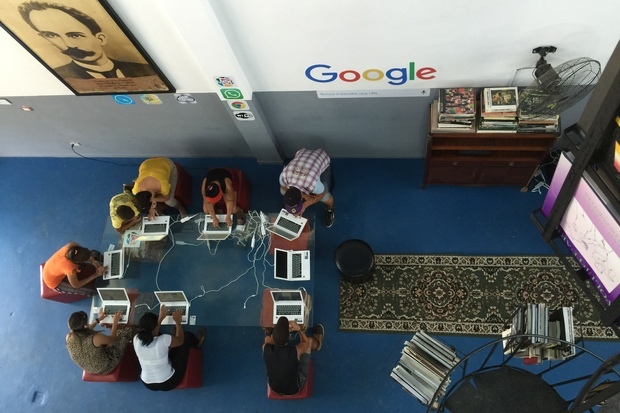 When President Obama said in Havana last month that Google would be working to improve Internet access in Cuba, I wondered what Google might do in Cuba that other companies could not. Today, Cuba is an Internet desert where only 5% of trusted elites are allowed to have (slow dial-up) Internet connections at home, and a paltry 400,000 people access the Internet through sidewalk Wi-Fi hotspots. These hotspots have existed for only a year or so. Also, some 2.5 million Cubans have government-created email accounts, but no Web access. I spent a month in Cuba until last week, and I was there when the president spoke. I'm here to report that those government Wi-Fi hotspots are rare, slow and expensive. While in Cuba, my wife, son and I spent about $300 on Wi-Fi. In a country where the average wage ranges from $15 to $30 per month, connecting is a massive financial burden available only to a lucky minority with private businesses or generous relatives in Miami. And this is why I think the possibilities of what Google might accomplish in Cuba are misunderstood. It's not as if Cuba would have ubiquitous, affordable and fast Internet access if it just had the money or expertise to make it happen. The problem is that Cuba is a totalitarian Communist dictatorship. The outrageous price charged for Wi-Fi in Cuba can't possibly reflect the cost of providing the service. The price is really a way to restrict greater freedom of information to those who benefit from the Cuban system. The strange Wi-Fi card system is also a tool of political control. In order to buy a card, you have to show your ID, and your information is entered into the system. Everything done online using a specific Wi-Fi card is associated with a specific person. The Cuban government allows people to run privately owned small hotels, called casas particulares, and small home restaurants, called paladares. The owners of these small businesses would love to provide their guests with Wi-Fi, but the Cuban government doesn't allow it. Nor does it allow state-owned restaurants, bars and cafes to provide Wi-Fi.